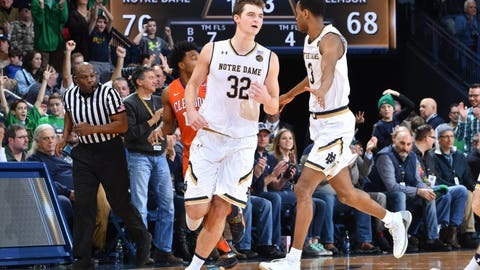 Notre Dame basketball is set to take on Miami as they look to keep their perfect ACC record alive and well. Catholics vs Convicts may not be the title of this ACC battle between the Fighting Irish and the Hurricanes. But there’s no denying this matchup will find a way to excite fans. Coming off one of the most important games of his career, V.J. Beachem is looking to lead the Irish to another victory. Although Notre Dame struggled against Clemson, they proved their talent is strong enough to get them out of close situations. Miami is definitely a more challenging opponent than Clemson. If the game comes down to the final minutes like the Irish’s last match, the Hurricanes have a much better shot at claiming a victory than the Tigers. One of the biggest problems for the Irish in this matchup will be stopping Bruce Brown. The freshman guard may only be 6’1, 180-pounds, but his ability to score, rebound, and assist make him a threat to anyone. Averaging 10.9 points and 7.3 rebounds per game, Brown will need constant attention from multiple Notre Dame players. Guarding this athletic guard will likely be on Matt Farrell’s shoulders. Farrell has broken through as Notre Dame’s leader this season. When he clicks, the teams seems to be unstoppable. This game, it won’t be up to Farrell to produce on the offensive end as much as he’ll be relied on for his defense. In the front court, Bonzie Colson is Notre Dame’s force. When he dominates down low, Notre Dame usually finds a way to win. Miami’s Kamari Murphy may not be the reason the Hurricanes are 11-3, but he’s been a contributor. Colson comes into this game a heavy favorite in this matchup. He may be three inches shorter than Murphy, but he’s shown all season that no matter the height of his opponent he can win the battle down low. When it comes down to it all, though, Notre Dame’s success is going to come from their stars. If Farrell, Colson, Beachem, and the rest of the Irish’s core plays well for 40 minutes, then they can’t be beaten. PREDICTION: Notre Dame stays unbeaten in the ACC and moves to 15-2 on the year with a win over the Hurricanes. Notre Dame isn’t going to come out anywhere near as slow as they did against Clemson. Right from the gate, the Irish will try to take this game over. After Colson starts dominating the paint, Notre Dame will begin to spread the floor. From there, the game is entirely in Notre Dame’s hands. And it isn’t likely they’re going to give it up. Farrell and Steve Vasturia will be able to stop Bruce Brown whether it’s collectively or as individuals. Either way, once they find a way to slow him down, Miami will be down to one scorer. If they can stall Ja’Quan Newton, which they will, Miami will have nothing left on the offensive end. Want your voice heard? Join the Slap the Sign team! This game shouldn’t be too big of a blowout but has every opportunity for the Irish to run away early. Either way, Notre Dame moves to 4-0 with a win over Miami.